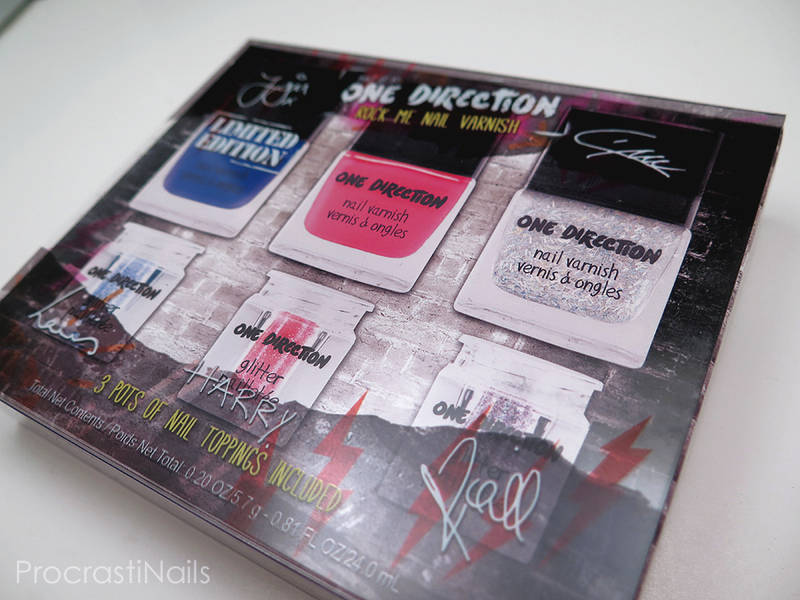 Makeup by One Direction Swatch and Review: Liquilights Glow Gloss + Rock Me Nail Kit! Hello hello! Bad news and good news today. The bad news is that my nails are still rounded nubs. The good news is I have some awesome bright polishes from Markwins Beauty through BrandBacker to swatch for you, and I always think brights look best on short nails! So ultimately it's a win! Yay! I also have some bright and fun lip glosses to share with you - that's a lot of content so let's get right into it! Description: Liquilights Glow Gloss sparkles brilliantly during the day and illuminates under UV black light after dark. Enriched with natural oils and vitamin E to keep your lips soft and hydrated all day and all night. Gloss can be worn alone for a pop of sparkle and color, or paired with One Direction crème lipstick for a bolder look. 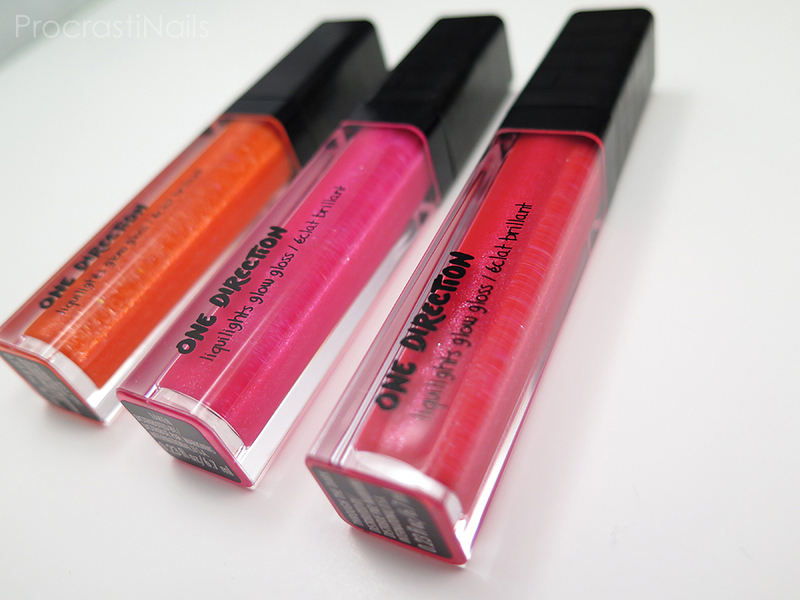 So first off we have the lip glosses! This cute set came with three shades - Kiss You (an "orange glitter rush lip gloss that glows to neon yellow under UV light"), Taken (a "powerhouse glitter pink lip gloss that glows to neon orange under UV light") and Through the Dark (an "electric glitter poppy lip gloss that glows to neon red-orange under UV light"). 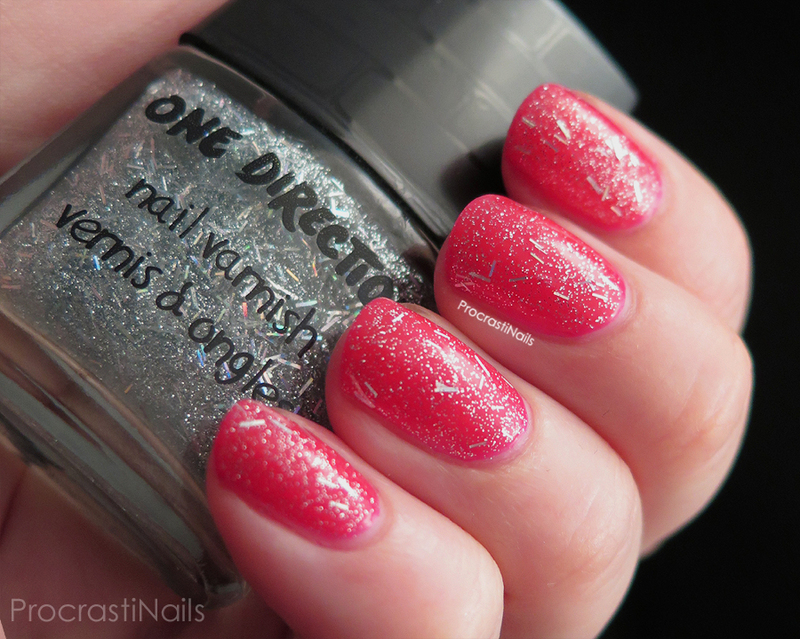 Through the Dark is definitely my favourite from this set, but they're all fun in that pumped-up super glittery way. And when I say glittery I mean it! Not only does it come through when applied but when you wipe it off there's a whimsical hint of sparkle left on your skin. Generally I'm not a lip gloss kind of girl (when I put something on my lips I expect not to have to re-apply) but for glosses I think these are nice - a bit sticky (which is another reason I don't like gloss) but highly pigmented. The UV angle is fun too, but unfortunately I couldn't get my lights to cooperate to capture it. I think the idea of going out and having UV reactive makeup on is an amazingly fun idea. And now let's move on to what I was most excited about... 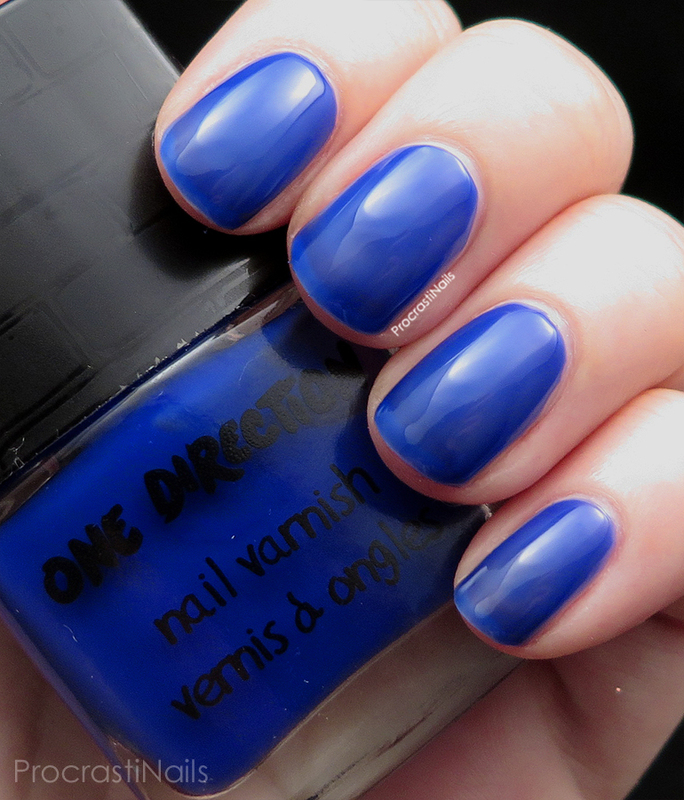 The nail polish! 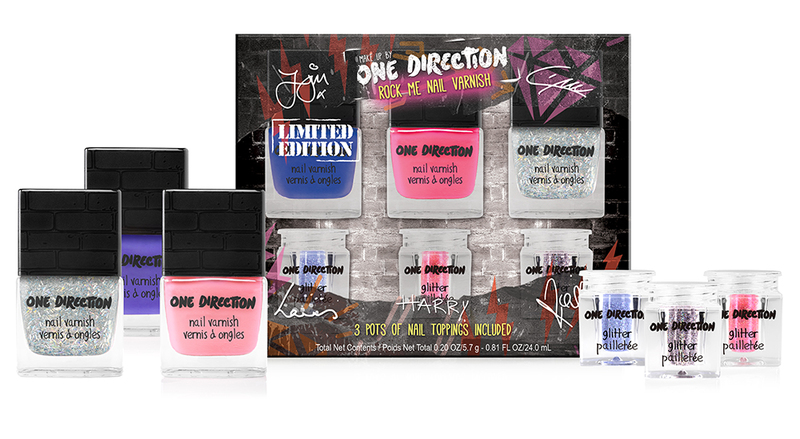 Description: Rock Me Nail Kit features neon UV reactive nail varnish and UV reactive glitter nail toppings that add even more sizzle to your mani, for nails that light up day and night. Sprinkle the glitter over wet polish for a subtle accent, or go for the glitz and dip your entire wet mani in mega-watt sparkle! This set came with two jelly polishes, one glitter top coat, and three containers of nail glitter that you can apply to wet nails for a punch of extra sparkle! Since I'm only swatching with one of the glitters I'll tell you a bit about them now. They came in three shades - Kicks (a "UV snow cone blue" which is pictured above), Not Afraid (a "UV electrified pink glitter") and Star (a "UV holo glitter"). Each came packaged in a cute and super practical little pot. The opening in the top is the exact size needed to dip in your finger, and the lid screws shut tightly. 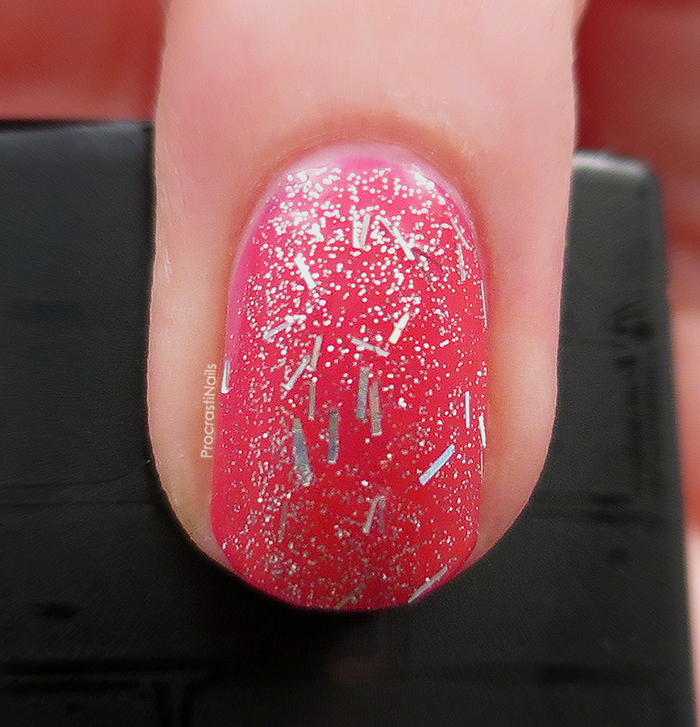 Definitely the best packaged nail glitter I've used in a while! 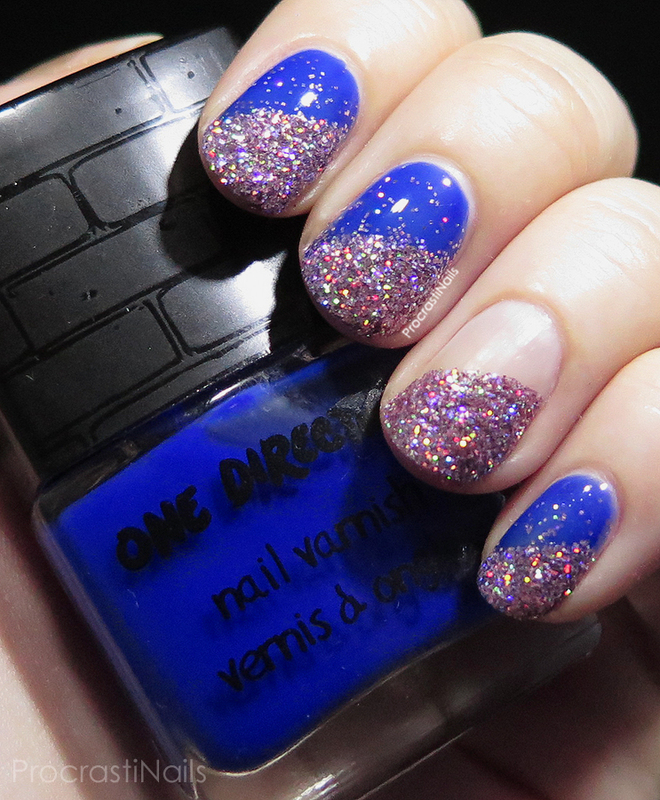 Happily is the first polish in this set and it's described as a "UV iced blue glitter." It's definitely a jelly polish which means if you want the colour to pop without any visible nail line you need to use some white undies with it. What you see here is three coats without top coat. Blue jelly polishes in general can be difficult to get a consistent application with, but honestly I really love how Happily went on once it was built up. It does take a while to dry though, so if you give this a try make sure you don't have to rush off anywhere for a while. 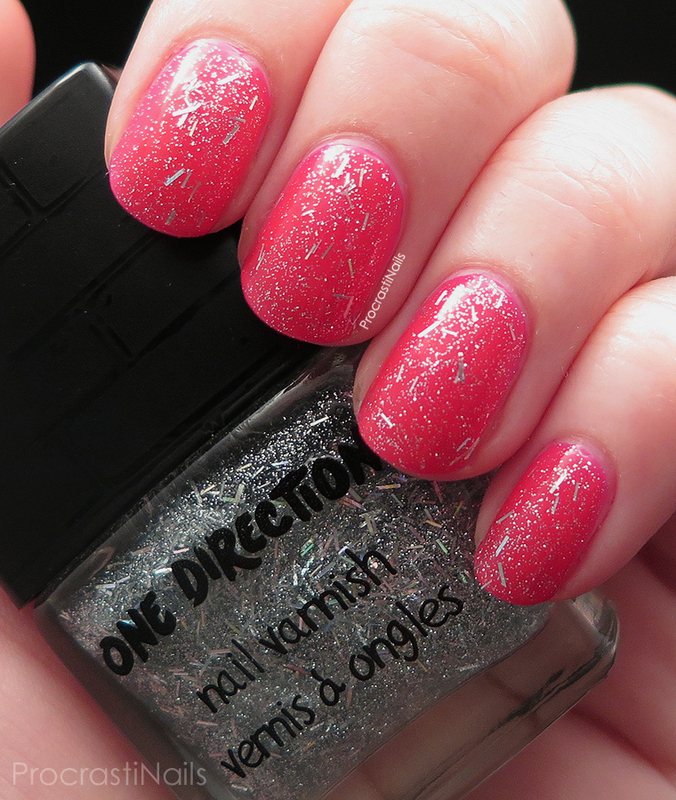 Moments is described as a "UV neon pink" and it's another three-coater jelly polish. Considering how bright the pigment is I was (pleasantly) surprised by how glossy the finish is without top coat. Would I call it a neon? No since it isn't matte, but it's definitely bright and I definitely like it! This one applied great and just like Happily it took a while to dry. Diana is the glitter topper the was included in this set, though it's got enough glitter packed in it that I have no doubt it would be near-opaque with three coats. 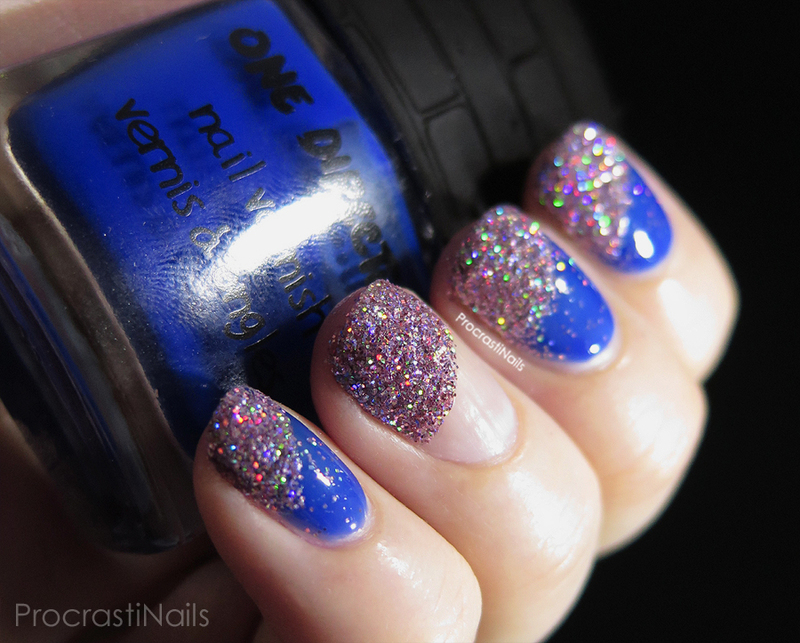 It's described as a "UV 3D holographic" polish, and it's full of holo microglitter and bar glitter. What you see here is one coat layered on top of Moments and it applied wonderful with no need for dabbing or touch-ups to even coverage. Overall I'm really satisfied with the polishes in this collection. I've become a fan of jelly polishes over the past year and I'm already planning to pull these out again for some leadlighting nail art in the future! I would say they're a more highly pigmented version of the OPI Sheer Tints from earlier this year (and application for both blues is similar though I would say Happily applied less streaky). Yeah, I was super impressed with the pigmentation! And the polishes are awesome, I'm definitely going to use the pink in the summer. Eye glitter terrifies me because I assume I would just accidentally blind myself! Fun sets these are. 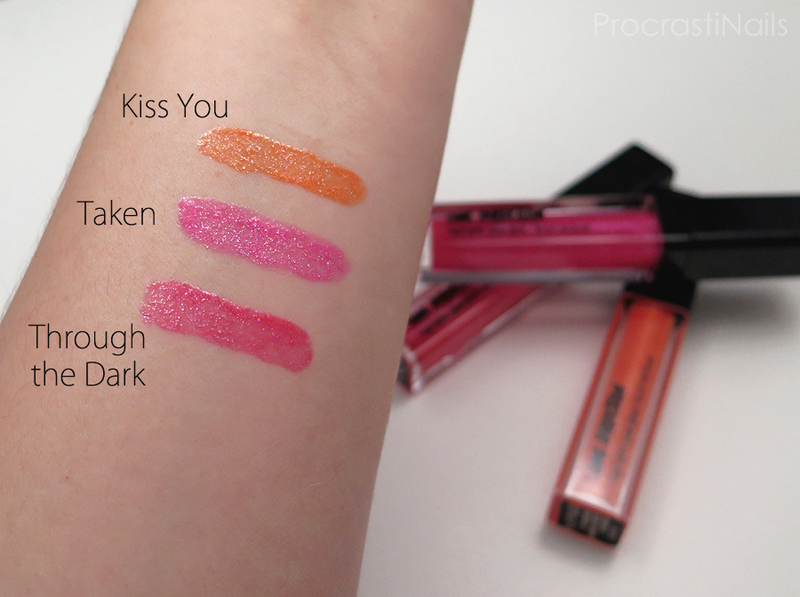 The lip glosses are fun and shimmery colors. I love what you did with these polishes. The colors are so bright and look fun. Surprisingly, I'm digging the lippies over the polishes! Nice swatches! 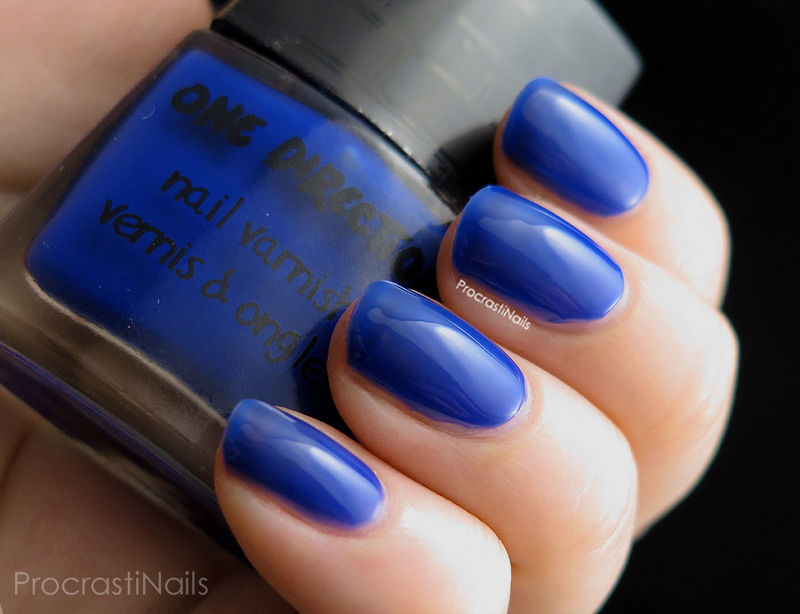 Aaaah, that blue shade is delicious ♥. They look great and all but I'm just not sure about buying boyband branded products. It seems weird to me. I'm rather impressed by the intensity of these jelly nail polishes! And I must have that orange lip gloss.. for upcoming football championships and the annual King's Day here in Holland, it would be PERFECT! 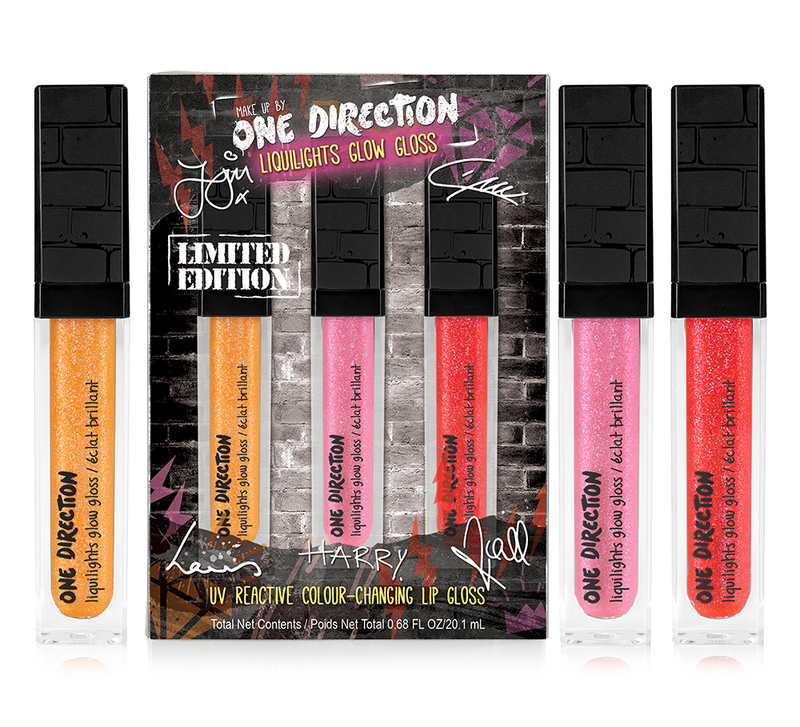 Seriously not a fan of lip gloss, and these sound too sticky for me for sure. Happily is a really pretty polish! I'm a sheer gloss kind of person but those shade are beautiful. The jellies look really nice on you! I haven't tried using loose glitter like that, it seems messy and I'll have it all over the place for sure! The polishes looks so pretty! I dig those glosses and those look like nice jellies! where i can buy these in italy? ?